Today’s buyers benefit from more choice than ever before, with both traditional and contemporary radiators on the market which promise a range of great benefits for a wide variety of different spaces. Whether going for the traditional route or opting for something more contemporary, this guide provides plenty of options for the discerning buyer as well as a few handy hints for deciding between the two. This entry was posted in Designer Radiators, Traditional Radiators on April 10, 2019 by Sam. If you’re seeking a new radiator to adorn your bathroom wall then look no further than this very page, we’ve got ten of the best to suit bathrooms of any size and style. Our extensive range of designer radiators offers superior quality combined with contemporary design, so you can choose any one of these 10 most popular modern bathroom radiators and bathroom towel rails with confidence. This entry was posted in Bathroom Radiators on April 8, 2019 by Sam. Plants need space to grow, and before you can even consider planting flowers to help make your garden come to life, you’ll need to remove any existing weeds which have sprung up during the colder months. It’s vital to do this before they have a chance to spread further, so be sure to remove the roots as well as the bits of the plant which are visible. This entry was posted in Electric radiators on April 4, 2019 by Sam. Conservatories are a common sight in gardens all over the UK. Not only do they allow homeowners to add to the space provided in their properties without the expense of an extension, but they also make ideal areas for dining, playrooms for the kids or just a space for the whole family to enjoy. But if conservatories have one major downfall, it’s the fact that they can become incredibly cold and unwelcoming in the cooler months meaning that nobody wants to spend any particular length of time in them. This entry was posted in Aeon Radiators, Wall Stays on April 2, 2019 by Sam. If you’re looking to overhaul your current home radiators or underfloor heating systems, then you’ll need to be 100% certain that the brand you choose offers superior quality and longevity. With so many sites online selling designer radiators and electric radiators and all offering what seems like a good deal, how can you be sure that you’re spending your hard-earned cash on the right product and picking something that will keep your home warm and cosy while looking great for years to come? In this guide, we’ll be uncovering the best designer radiator brands and the questions you need to ask yourself before choosing the best product to suit your needs. Where are you placing the new radiator? To start narrowing the search, you’ll need to know where your new rad is going to located. By viewing our wide range of bathroom radiators, kitchen radiators, living room radiators and towel radiators ideal for bathrooms and downstairs WC’s, you’ll begin to get an idea of the styles and types of radiators that suit your home décor style and available space. Once you’ve got a style in mind, it makes it so much easier to start to narrow down your search for the best brand to heat your home. If space is an issue, but you still want to maintain a warm and comfortable temperature, you might want to consider underfloor heating instead as this provides excellent heating capabilities while keeping your walls free of units that take up space. In rooms where you need additional heating, but you don’t want to touch the current central heating pipes or have to pull up floorboards and get a plumber involved in fitting your new radiator, then an electric radiator can offer a simple solution and still give you the style and heating output you’ve been seeking. Vertical radiators are also another great way of saving space, and thanks to their sleek and modern design, they also offer an eye-catching focal point too. These are just a few more elements that you’ll need to consider when seeking out the best radiator for your needs, so don’t forget to take all of these items into account. By now, you’ve probably got a good idea of the type, size and style of the radiator you want, so its time to consider the guarantees offered by each product. Some cheaper designs are constructed using inferior quality materials that won’t have the long lifespan and heating capabilities that you’re looking for, so beware of units, brands or retailers that don’t have a robust guarantee. These are often accompanied by too good to be true pricing. You’ll find that these items will let you down and you’ll have no guarantee to rely on should there be any issues later on down the line. Designer Radiator Direct only stocks leading radiator brands that combine great design with excellent quality and reliability, and many of the product lines we stock come complete with a guarantee of up to 20 years, so you know that you’re getting the best quality for your money. Guarantees of a year or two don’t offer the protection you need should something go wrong, so make sure that whatever style or size of designer radiator you choose, you go for the product that offers the longest guarantee available. Many of the designs we stock are very popular lines. As we know they are in demand consistently, we usually have a good stock available in our warehouse ready to be shipped out as soon as an order is placed via phone or on our website. Some of our more customisable radiators (the ones available in an array of colours or finishes) are made to order by the high-quality manufacturers that we choose to work with; therefore some of the delivery timescales can be a little longer as each individual radiator is fully customised to suit your required specifications. Once your new designer radiator is ready for dispatch, the manufacturer will pack your new purchase to safeguard the item against any bumps or knocks during transit and arrange for it to be delivered to your home ready for it to adorn your walls and keep your rooms cost and warm. Should there be any issues with the delivery service or product once it arrives, the team at Designer Radiators Director are just a phone call away and able to assist you with any queries you might have as 100% customer satisfaction and happiness is our goal. Check on the delivery timescale for your project before you make a final decision as this might help you decide between items on your shortlist. This entry was posted in Home Improvement on March 28, 2019 by Sam. Designer radiators have been helping homeowners express their individual sense of style and adorning the walls of homes across the UK for several years, but modern radiators offer far more than just a stylish way to keep your home cosy and warm. Here’s seven interesting facts about designer radiators that you might not have come across before. This entry was posted in Designer Radiators on March 26, 2019 by Sam. The kitchen is the heart of any home, but it can be less than welcoming in the winter months if you don’t have any kitchen radiators to continually supply the room with warm air. Often one of the busiest rooms in the house, the space in our kitchens is precious as we have a collection of cupboards and appliances all jostling for wall space. 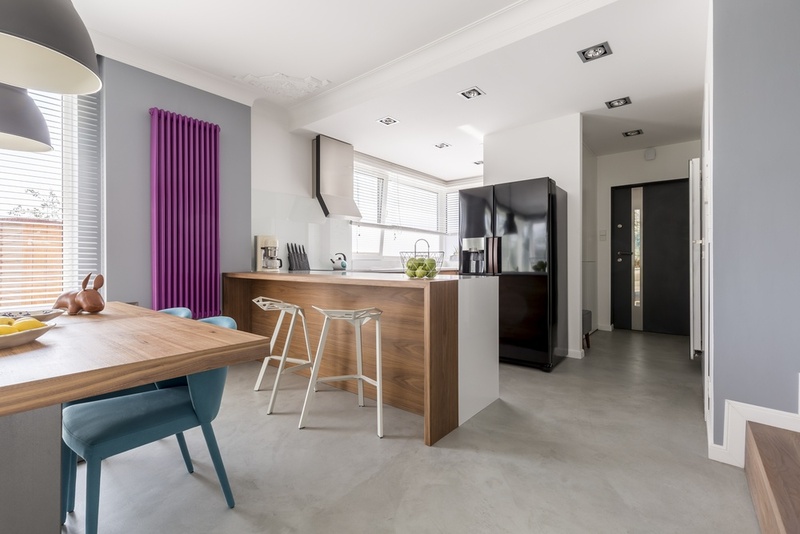 This is why vertical radiators and designer radiators have become increasingly popular with homeowners who want to heat their kitchens during the colder months but don’t have a lot of space to spare. This entry was posted in Kitchen Radiators on March 22, 2019 by Sam. Traditional Radiators: Is It Fashionable? Traditional radiators are making a big comeback when it comes to fashionable home décor. With an array of colours, sizes, decorative styles and colour finishes to choose from, there’s a traditional radiator suitable for any room of the house, budget and personal taste. The vintage trend doesn’t seem to be going anywhere soon either, so a traditional radiator is sure to provide your home with a real talking point for many years to come. This entry was posted in Cast Iron Radiator, Traditional Radiators on March 20, 2019 by Sam. Look around any home, and you’ll usually find a radiator nestled just beneath the window sill. Typically this is done to provide heat and warmth to an area which can often lose valuable heat, but aesthetics often take a back seat. However, you can make better use of this under-utilised space to bring your whole room together by transforming your under-window heating into an attention-grabbing focal point with our range of designer radiators. Read on to discover why our selection of horizontal radiators offers the perfect heating solution for those small, forgotten spaces. This entry was posted in Horizontal radiators on March 18, 2019 by Sam. First impressions count when it comes to your business premises, so you want to use your décor to create the right idea about your company. Designer radiators aren’t just a great way of adding a stylish addition to your office space, their excellent heat output can ensure that your employees enjoy a comfortable temperature during the colder months and productivity isn’t hindered by frosty fingers and toes! This entry was posted in Flat panel radiators, Help & Tips on March 14, 2019 by Sam. Doing a little decorating this year? There’s nothing quite like the satisfaction you get from applying a fresh coat of paint to any room in the house. Unfortunately, it’s not always straightforward and you may find a radiator or two in the way of your roller. We’re here to tell you that you don’t need to let the prospect of having to take your home radiators off the wall dampen your enthusiasm for DIY. A standard rad is easy to remove when painting (and to put back again). Read on for our quick guide to removing either vertical radiators or horizontal radiators from your walls with the minimum of fuss. This entry was posted in Home Improvement on March 12, 2019 by Sam. Finding wall mounted radiators to fit in a small space, such as a kitchen or bathroom, can seem like a challenge. Some might fit the size criteria perfectly, but not offer the sleek and stylish design you’ve been hoping for whereas others might fit the décor bill, but be way too large for such a small space. With house sizes getting smaller and space being at a premium in new build properties, many high-quality manufactures of vertical radiators and towel radiators have been hard at work designing some impressive, yet space-saving solutions for any new homeowner’s wall mounted radiator needs. This entry was posted in Vertical radiators on March 8, 2019 by Sam. Keeping your radiators and heated towel rails working correctly so that they can kick out fantastic levels of heat and continue to keep our homes cosy and fluffy towels warm and dry, can sometimes be a challenge. However, an inhibitor chemical is a great way to help your central heating system fight the build up of unwanted sludge and keep everything working as it should. This sludge not only sounds disgusting, but it can stop the water in your radiators and towel rails circulating properly making them noisy and cool to the touch when they should be silent and warm. This entry was posted in Towel Rails on March 6, 2019 by Sam. If you’ve noticed that your central heating radiators are making a dripping or trickling sound, it could be a sign that they aren’t working as they should. Not only is the sound annoying, but you might also notice that several cold patches have started to appear on your radiators which means they aren’t emitting heat properly or at the level they should. This entry was posted in Bleeding on March 4, 2019 by Sam. If your small radiator is looking a little worn and tired and isn’t kicking out as much heat as you’d like, you might be wondering if you could replace it with a sleek new designer radiator without much effort. The answer is a resounding yes! The good news is that you won’t need to engage the services of a plumber or fork out money on expensive tools to do it either because it’s something that you and a friend can achieve quite easily with a few bits and pieces that many of us already have in our at home toolboxes. Here’s a step by step guide to walk you through the process of replacing any one of your small radiators with shiny new designer radiators in just a few hours. This entry was posted in Help & Tips on February 27, 2019 by Sam. Electric heated radiators and towel radiators alike both act as a stylish focal point for any bathroom large or small which can make choosing difficult, especially if you’re, not sure which type suits your décor and family needs best. Read on for our ultimate style guide, filled with useful suggestions on the best towel radiators for your needs as well as detailing a few models that can offer the perfect partnership between heat output and style. This entry was posted in Towel Rails on February 25, 2019 by Sam. Moving Your Radiator Across The Room? No Problem! Renovating your home is a great way of showcasing your individual taste and style, so it’s no wonder that many homeowners undertake some form of DIY or home décor project at least once a year. Many of us will know the feeling of hitting a stumbling block that puts a halt to our plans for a room makeover, and radiators in the wrong position can seem like a big challenge to overcome. Instead of packing up your decorating tools and feeling disheartened, don’t worry! It is entirely possible to move your designer radiator into a whole new position in the room so that it gets the prominence it deserves without getting in the way of the rest of your DIY and décor plans. This entry was posted in Designer Radiators on February 22, 2019 by Sam. What Should You Do If Your Boiler Is Working But Your Radiators Are Cold? If you’ve noticed that your central heating radiators remain cool to the touch yet you’ve set them to heat up; you could well be concerned that there might be a problem with your boiler. After closer inspection and running some hot water with no problems, it may seem that your boiler appears to be functioning normally aside from the issue of your radiators aren’t heating up. Instead of jumping straight on the phone to get in touch with the boiler company or a local plumber, here’s a quick radiator troubleshooting guide that can help you pinpoint the problem quickly and save you valuable time and money in the process. This entry was posted in Help & Tips on February 20, 2019 by Sam. Think Radiators are Boring? Think Again! Radiators are often one of the most overlooked elements of a room renovation. They don’t command as much thought as say, a new sofa, the paint colour for the walls or flooring choices but, as much as they may be considered an accent piece, the new generation of modern radiators actually turns this rule on its head. Stylish, aesthetically pleasing, durable and functional, they are increasingly focal points in their own right and many can pass as a piece of furniture rather than a part of the fabric of the building. If you’re guilty of thinking of radiators as something boring that you must have rather than a statement piece that you actually want because it adds a beautiful edge to your room, read on for our showcase of some of the most striking designer radiators available now. We think you may just change your mind! This entry was posted in Uncategorized on February 18, 2019 by Sam. If you’re looking to upgrade your bathroom or just want to liven things up a little with a shiny new fixture, then you can’t go far wrong by opting for a new bathroom radiator. Not only are electric bathroom radiators great to look at thanks to their sleek, modern design, but bathroom towel rails are also an easy and practical way to ensure that there’s always a warm fluffy towel close at hand out. They perform double duty too if you need to quickly dry a damp item of clothing and don’t want to turn on the tumble drier. Let’s take a look at six of the best bathroom radiators including a towel rail to find the perfect addition to your bathroom. This entry was posted in Towel Rails on February 14, 2019 by Sam.